Comic-Con is under way in San Diego, California, and it always delivers lots of spoilers and surprises. However, this particular news has us bummed out. Even though TV Line hinted back in May that it might happen, we were hoping it wasn't true. Andrew Lincoln is officially departing The Walking Dead after the upcoming season airs. He has played Rick Grimes since the beginning, making him one of the OGs of the AMC show. The news was revealed in an IMDb interview between Kevin Smith and The Walking Dead creator Robert Kirkman. 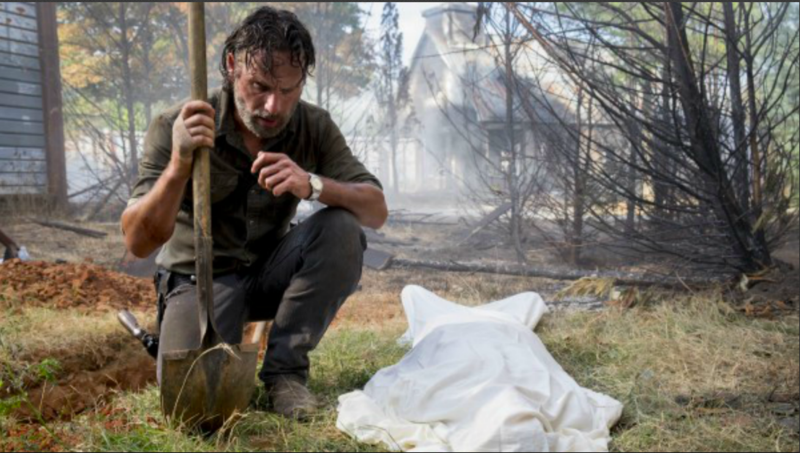 "Andrew Lincoln has said this will be his last season," Smith said. "It's looking that way," Kirkman said, laughing nervously. Then Smith raised a question that is probably on a lot of fans' minds: What about the plot-point issue between the TV series and the comic book? Can you have the character off the TV show but alive and well in the comic book? "It does make the differences between the comic and the show a little bit more pronounced. At the end of the day, it's all about Andrew Lincoln," Kirkman revealed. "He's a human being, he's someone I've known for almost a decade and somebody that I love. He's been sweating in Georgia away from his family for so long." So, it sounds like there are personal reasons for Lincoln's exit and his boss is being pretty understanding about the entire situation. It's a mature response, given that it does put a bit of a monkey wrench in the diverging storylines. As fans of The Walking Dead, we do feel the need to pout for a moment or two to mourn the loss of such an epic character. Then we will jump back on board with Kirkman and wish Lincoln well, since a good work-life balance is important. Sometimes we forget that Lincoln is a British actor because he hides that accent so well. His wife, Gael, and two children are overseas while he is filming in the U.S., and it has to be hard to be away from them for much of the time. Lincoln has probably missed a lot of major life moments, so we can't blame him for wanting a break after almost a decade on The Walking Dead. Now, what about that storyline? We need a few spoilers! Well, Kirkman didn't give us much. "He cares about the fans, he cares about the show deeply, he wants to something special on the way out. We have something amazing planned. I wouldn't want to spoil anything, but anyone who is a fan of his journey, who loves Rick Grimes, who loves the world of The Walking Dead — you're going to want to see what we do." We need to wrap our brains around the fact that Lincoln is only appearing in about "half a dozen episodes," according to Collider. The site also revealed that the show locked in Norman Reedus as the main focus of the series moving forward, so he was given a substantial pay bump to compensate for his new leading man status. All of the drama that happens off-screen really does affect the way we see the show play out on-screen. We are already chomping at the bit for the premiere of season nine of The Walking Dead, but it's still a few months away. Hopefully, a few more spoilers will sneak up on us before the October premiere.